#1- My Book has arrived at our house! My Book has arrived at our house! 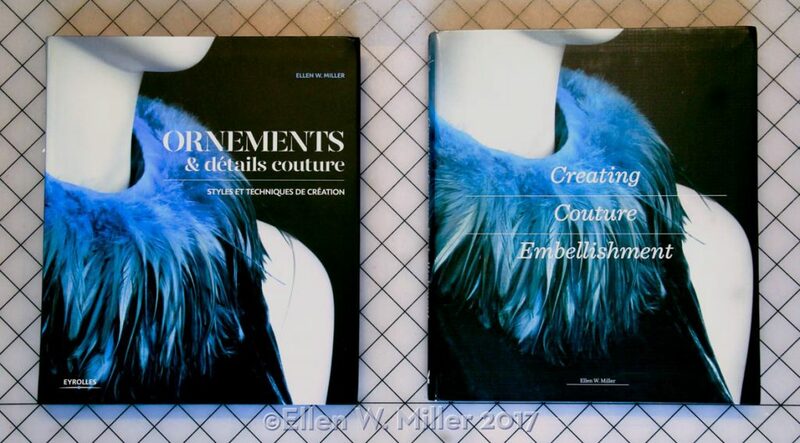 My copy of my Book, Creating Couture Embellishments, arrived in late May!!!! I am so excited! The book looks BEAUTIFUL! The photos are gorgeous, the illustrations are clear, the text is present on the page, but doesn’t fight with the photos. Everyone at Laurence King Publishing did an amazing job: Thank you! This project started seven years ago when someone from Laurence King Publishing (LKP) sent an email to the School of Fashion Design (SFD) asking if any of the teachers were thinking about writing a book. Jim Hannon, head of SFD, forwarded the email to the staff. Hmm…At our Passover Seder that spring, my friend Diana and I had joked that we should write books together one summer; she is a Psychiatrist, I am a fashion design teacher. Should we spend the summer writing together? At the time my mother was quite sick and needed more of my time, so I was contemplating taking a leave of absence from teaching. Maybe taking care of my mother and writing a book would be just the ticket for me. I spent the summer dreaming about writing a book. The basis of Creating Couture Embellishments was a class I taught at SFD: Couture Details. Many of the techniques in Creating Couture Embellishments are straight from my lessons, but some of the techniques were subjects I needed to research further. I knew how to make lots of Flowers, but I had no idea how many different decorations could be made from folding ribbon. I knew how to manipulate and sew lace but I never knew the history of lace making and how the nomenclature came about. Researching and making the samples for the book was time consuming but great fun. Learning to photograph the samples and to write in an academic voice was harder. Normally I write in a chatty voice, as though we were having a conversation, but textbooks require an academic voice. “Just snug the ribbon over until it looks right” won’t do; “Pulling gently on the thread, gather the ribbon into petals” is better. The photographs show exactly where the thread goes through the fabric and must match the text. Having good photos for Steps 1 & 3, but not for Step 2 meant that I needed to redo the entire sequence, otherwise the thread could be 3” long in one photo and 6” long in the next photo. Thus, the two-year timetable went out the window and two years became five years. During those five years my editor at LKP, Anne, never said, “Hurry up” or “What’s taking so long?” Every chapter I submitted was greeted with words of good cheer, followed by edits: photo suggestions, Step improvements, rewrites and general tiding up of the text. Anne, Jodi and many other editors, and I, were careful to get each step right: with the photos and in the text. The results of many years of concentrated work and patient editing are now before me: in this very real copy of Creating Couture Embellishments! Thank you to everyone who helped make this book so beautiful! I hope you find Creating Couture Embellishments helpful, instructive and inspiring.